Do you print lot of online content? Shorcut key for print preview can for sure make your life easy. 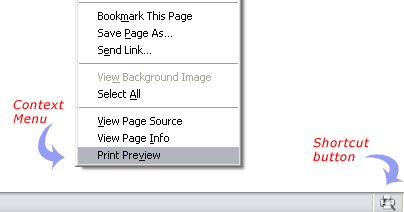 Firefox users can easily add easy to access print preview options using “Print Preview” plugin. Open any webpage and you can access print preview window using a shortcut key. right click context menu and icon on the status bar. – Use Shortcut key Shift + P to open print preview dialog box. – Click on the print preview button at right of status bar in Firefox. – Open right click menu & click print preview option. Download Print Preview Firefox addon for quick access shortcut key, button and right click context menu option. This for sure will load Firefox with feature for super quick access to print preview dialog box.